The all new Acid HRD Carbon series is a new school freestyle machine that features a new rocker and concave shape that delivers better speed control and better pop for the ultimate rider. The proprietary F-One carbon construction offers improved strength to weight ratio and offers riders increase control, maximum edge grip and pop anytime, anywhere! The Acid comes equipped with our revolutionary helical rail design that give the Acid superior edging, impressive stability and precision, huge comfort and forgiving, smoother landings. Give our new school freestyle a weapon a try and never look back! The 2016 F-One Acid HRD has optimized the rocker and concave shape dedicated to New School Freestyle resulting in a better speed control and pop, combined with the improved deck making it more stress resistant. DOUBLE CONCAVE The V SHAPE you can find on the SPICY is variable along the board. Smaller in the center, the V double concave is at its max under the feet, and eventually disappear at the tips. DUAL CORE DUAL CORE technology is the combination of wood and closed-cell foam to achieve a core of ideal stiffness and weight. Wake style boards required higher volume and therefore more thickness. So in order to keep the weight down, closed-cell foam is used as core material in low stress areas of the board while wood remains in high loads areas to get a durable board with a perfectly tuned flex. LIFTED TIP CHANNELS These channels help provide superior grip towards the tip of the board and are designed to be super-efficient during the pop. To form the channels, the tip of the board is raised in its central part, therefore creating added lift locally to the rocker of the board for better pop and easier landings. HYBRID CAP RAIL ABS HYBRID CAP RAIL is a construction process which cleverly combines the sleek lines and perfect grip of a cap construction rail with the toughness and durability of an ABS rail. As on a cap construction, the deck comes down towards the rail but finishes on a rounded ABS sidewall providing a shape similar to a surf style rail. UNIBOX The patented UNIBOX system and RESPONSE fins have a radical effect : the asymmetrical profile improves the general ride and early planing. However, it is the flex of the RESPONSE fins that gives amazing rail-grip as well as pop and forgiveness on heavy freestyle landings. Liquid Force took Christophe Tack’s World Freestyle tour winning Element and tuned it up to be an ultra light weight, freestyle dominating board. The Element features a shallow single concave center, with quad channels through the tips. This in conjunction with a medium rocker line and a fairly square outline give the Element Carbon a ridiculous amount of pop when you load the lines, and enables this board to carry a ton of speed! 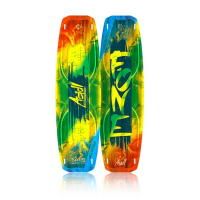 Although this board is shaped for the world champion of freestyle it is not limited to strictly freestyle. The carbon construction makes this board smooth through chop. The relatively low rocker, and square outline also make this board a good option for riding aggressively in light winds. The Carbon Element takes a proven freestyle design, and combines premium carbon construction to make this board very nimble, lightweight, and it looks great. The Carbon Element works well when you are well powered, or under so you know you are always prepared for the session. If you are looking for an extra edge to help improve your freestyle skills the Carbon Element is the board for you! The ultra lightweight Carbon Element utilizes a unique honeycomb top and bottom biaxis carbon weave which reduces the weight beyond standard carbon fiber board laminations. This construction combined with a shallow concave center hull to a deep channeled tip shape delivers the ultimate freestyle experience. 100% Carbon Lam Construction This is a 100% Carbon Laminated Liquid Force kiteboarding, one of the lightest high performance boards on the planet. Since this is 100% pure carbon laminated the use of boot bindings on this board is not recommended. Women’s Freeride/Freestyle The Alana is designed for women who want all-around freeride, freestyle and TT waveriding versatility within a single board. Its outline, flex and dimensions have all been fine-tuned to respond to lighter degrees of rider input and lower loads. A medium rocker profile provides a forgiving ride and lively feel, while its supreme wood core delivers a soft, natural flex with a high strength-to-weight ratio. This, combined with its 3D bottom shaping, provides superior grip, forgiving landings and directional stability in a wide range of conditions. In addition, sizes on the Alana have been modified to accommodate a wider range of riders. - NEW Medium Flex F40 = Ideal for slow-to-medium speed riding - Freeride Rocker = Powerful + fast riding + aggressive pop + lively feel - NEW FTC 2.0 (Flex Torsion Control) = Optimized stiffness in both the axial & torsional axis + superior control - 10° Angle Fin Platform = Superior grip + upwind performance 2017 Naish Alana Twin Tip from Naish Kiteboarding on Vimeo. Performance Freestyle/Wakestyle The Stomp offers riders the best of all worlds: superior freestyle and freeride performance with the advantages of a wakestyle-inspired design. Ideal for aggressive wakestyle riders using footstraps or boots, this board delivers insane drive, edging and pop. The Medium-to-high rocker grants ample pop, while delivering a smooth ride in chop. Its tapered rails reduce weight in the tips, defining the edges for increased grip and solid directional stability. The newly developed 3D bottom shaping utilizes center razor channels for increased edging performance and trapezoidal skidplates with a large vertical area for unmatched grip when loading for a huge maneuver.